The Writing Bug: Game On, Authors! The 2014 Winter Olympics will grace our television screens in a few weeks, and many of us will be figuratively glued to our seats as we amaze at skiers, skaters, and bobsledders while, at the same time, we wonder why Curling is still a competitive sport. At some point during all this coverage and the numerous, sometimes never-ending, commercial breaks, Bob Costas or one of the other NBC Sports folks will profile an Olympic athlete. They'll talk about their friends, family, and the influential folks that led them to this point in their lives. Then, right before they start tearing up at being in the Olympics, the interviewee will talk about the long and grueling hours they have endured day after week after month after year to get to Soshi. You, with nachos in one hand and wine or microbrew in the other, will stare at the flat screen amazed at the determination of the Olympic athlete while you ignore the computer and all the story ideas waiting for you to start, finish, or submit. It's Game On for these Olympic contenders, so why isn't it the same for you? 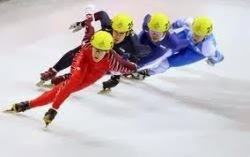 It's time to stop skating around the edges of your writing and head straight down the bobsled course to glide into your work. In other words, no more saying to yourself "One day I will ." and replace it with "Today I can." Look, it may seem hard, but author's today have a greater chance of being published than they did in the past thanks to self-publishing, independent publishers, and the Internet in general. With support from a critique group and editor friends, you should be able to get something published in no time. Sure, you may not gain an immediate following. On the other hand, you could have a virgin best seller on your hands that Bradley Cooper and Amy Adams are dying to do the film version of. Still don't believe me? Well, talk to some of my friends at Northern Colorado Writers. This year, many of them will be publishing books and stories either on their own or through traditional publishers. Heck, the tide is even turning for my critique group. After years writing and editing and rewriting and re-editing, my colleagues are ready to deliver their works to the reading public. Like I said, it's Game On, people!. Not just for the Olympic athletes but for all you writing athletes out there as well. Put down your microbrew, set the DVR to record the biathlon, and start writing. You'll be receiving your own gold medal before you know it. Is it Game On for you and your writing in 2014? Absolutely, Rich. It's time to just do it. It has always been game on for me. Although my late husband paid close attention to football, baseball, and basketball, they're not for me. A great motivational piece! Thanks Rich. Great post, Rich! And I want to start a critique group and would love to hear more about yours. Maybe I can catch up with you at the NCW conference in March! Thank you for the motivation, Rich! Can I write with my microbrew?